Dr. Roger Mason spent a week in Madrid. He was a guest of the Center for Intelligence Services and Democratic Systems, an inter-university program hosted by Rey Juan Carlos University. The Center is the home of The Institute of Intelligence Analysis and Democratic Systems. The institute is a graduate program training students for government and commercial intelligence careers. Dr. Mason is a part of the “visiting master” series that brings the students in contact with scholars and practitioners from around the world. The students spent two days learning about wargaming. 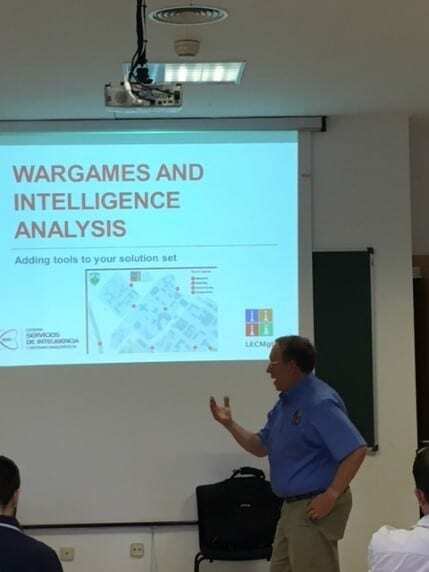 Dr. Mason lectured on the history of wargames, wargame theory, and the use of wargaming in intelligence analysis. 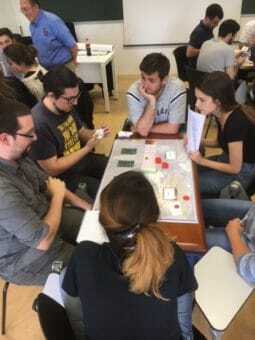 An important part of the curriculum is studying critical case studies including wargaming during World War II, the Sigma 64 Vietnam wargames, and the Able Archer ’83 Cold War wargame. 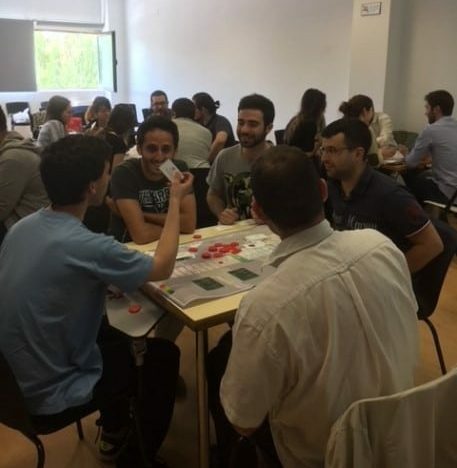 The students have an opportunity to design a game and on the second day to play The Intelligence Sovereignty Game. Dr. Mason reviews some of the recent terrorist incidents in Europe and asks the students if they were leading the various national intelligence services could they have prevented the attacks. The students are briefed on their role in the game and suddenly they are thrust in the position of making intelligence decisions for their simulated country while cooperating to prevent a terrorist attack. The centerpiece of the game is a crisis index which can offer sudden swings from stability to an increasing chance of a terror event. The students become immersed in some of the real world problems of the EU intelligence services. The students quickly grasp the difficulty of maintaining national sovereignty while cooperating with other nations in the war on terrorism. During the post-game discussion, students spoke about their experiences. One student remarked, “This game looked simple when we started. The longer it went the more complicated the problems became. I really got involved” Another student commented, “I can see how we can incorporate games and exercises into our commercial intelligence practice.” The next step for the students will be their Master’s thesis. Dr. Mason will be working with several students who are interested in including games and simulations in their research.